Under U.S. Air Cover, Afghan Commandos Chase The Elusive Taliban : Parallels Afghan commandos, supported by U.S. special operations forces, launched a raid into a village contested by the Taliban. The raid permitted an aid convoy to make progress after nearly a month. An Afghan commando stands on the tarmac, wearing night vision gear. 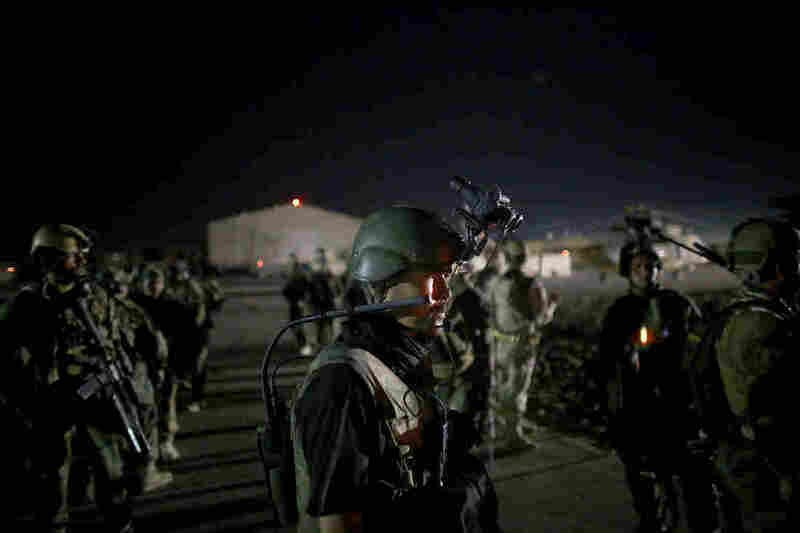 The elite commandos are about to fly into an area controlled by Taliban fighters. Their mission: to sweep a village for Taliban fighters. The American Green Berets were seated around a long, plywood table at their base when they spotted the Taliban counterattack on their screens. The burly Americans were working on computers, drinking coffee and munching on chips and peanut butter cookies. Their team leader answered an ever-ringing phone, giving his superiors updates on an Afghan commando mission in the mountains just north of Afghanistan's Kandahar Airfield. The Green Berets could see the progress of the mission on a massive screen on the wall — live video sent by an American drone. The Afghan commandos had opened fire on the Taliban, and they had fired back. An American AH-64 Apache attack helicopter sliced down to shred the defenders. Many scattered. Then, the American troops here spotted about two-dozen men — black-and-white figures on their monitors — carrying rifles and machine guns, moving along a dry riverbed, parallel to the Afghan commandos. The American soldiers discussed how to respond: Was there an armed drone available to release a Hellfire missile? Or an AC-130 Spooky gunship on hand, with its heavy artillery? But the Taliban answered the question on their own: When the men emerged from the woods, they had no weapons — knowing that meant the Americans could not fire. "Once we lose positive identification of the enemy, it is our policy not to strike, because our No. 1 concern is civilian casualties," said the Special Forces team leader. NPR was permitted to observe the operation under ground rules that included not identifying him by name. (Top) Afghan commandos on board an American Chinook helicopter flying to a Taliban-controlled village in the middle of the night. (Bottom) Commandos study a map of the village ahead of the sweep, before lining up on the tarmac to board American helicopters for the mission. The American and Afghan troops wanted to land a more decisive blow against the Taliban, but they said they tried to keep things in perspective. "Not every mission is going to have those stats you look for — enemy killed in action, enemy wounded in action," the team leader said. "It really is about the overall objective. And so it may seem frustrating, because obviously, at all points, you want to engage the enemy. But as long as the mission is accomplished, it is good for everybody." 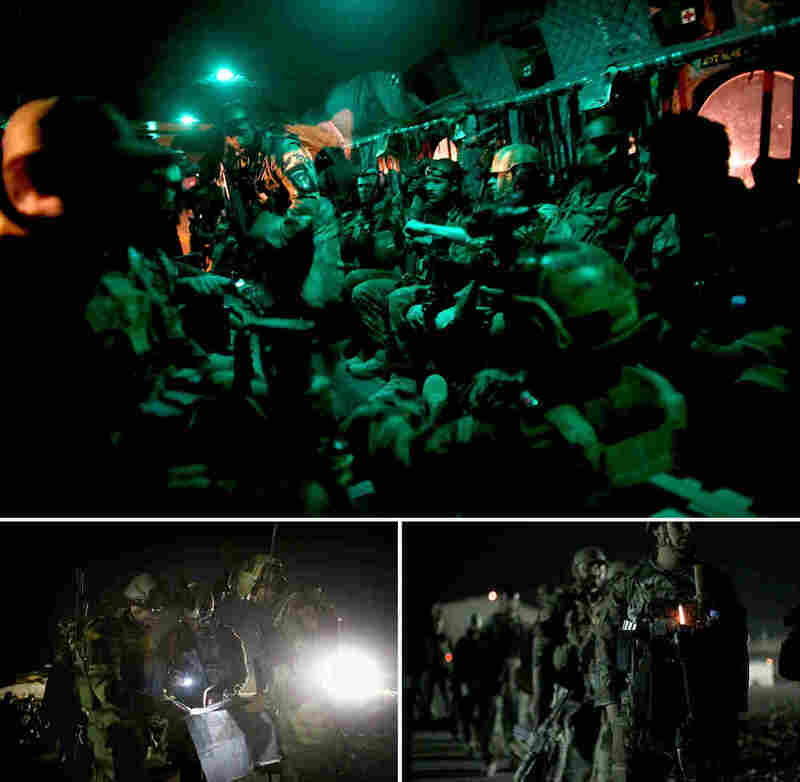 On this recent night in Afghanistan, commanders said the mission was accomplished. The Afghan special operations raid, American drone strikes and an Afghan army clearing operation helped push Taliban fighters from a town blocking a key highway. The insurgents had stopped aid shipments from getting through for nearly a month, and with them pushed out of town, the trucks could move again at last. 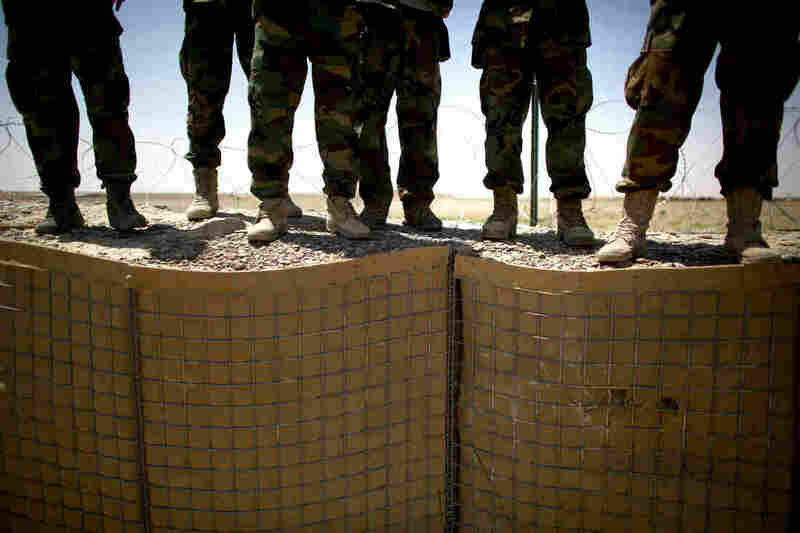 American officials point to the progress the Afghan forces have made in handling these kinds of operations. Afghan special operations Capt. Shoaib — NPR isn't including his last name because of safety concerns — led the mission, and helped plan the raid in a sandbox using Styrofoam blocks for buildings and toothpicks for trees. 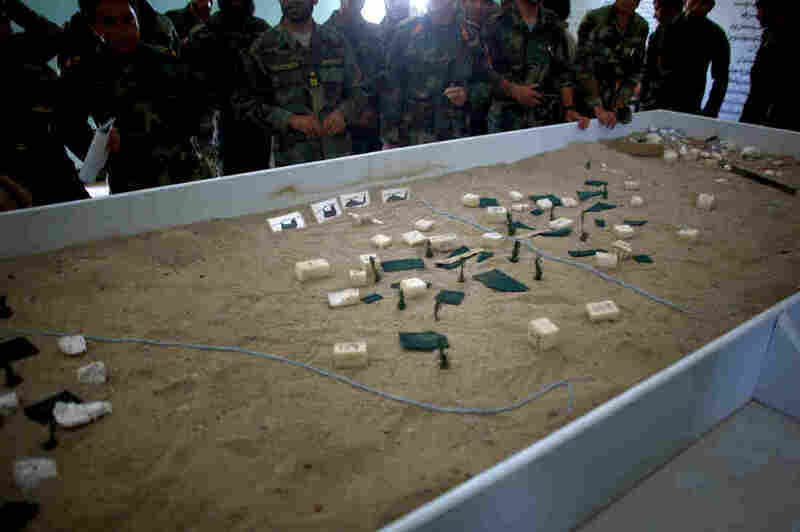 He and his men practiced here at the Kandahar base to line up and fan out the way they did when they went into action. The Afghans are conducting operations on their own, but they still need American air power for the more challenging ones — to take them into the fight, provide the invaluable overhead surveillance and smash their opponents. The Afghans are years away from being able to conduct this kind of operation on their own, if they ever can. And the other factors in Afghanistan aren't standing still. The mountainous district of Shah Wali Kot, where Capt. Shoaib and his troops attacked, has long been an open sore. Australian special operators battled the Taliban there six years ago in heavy fighting, but the insurgents have come back. And what's worse is that a recent internal Afghan power struggle meant that dozens of police officers abandoned their checkpoints along the highway. "We received information that 120 sentries, [all] at the same time, went to the Taliban," Capt. Shoaib told NPR. "They went with their weapons, ammunition, equipment — everything." The Taliban's strategy is to control the highways that run from Helmand province in the west — home to Afghanistan's lucrative crop of opium poppy — all the way east to the Taliban's headquarters in Pakistan. American commanders have nicknamed this route "the jet stream," and have watched as insurgents have set about grabbing territory to put it together. If the Taliban could control the whole route, they likely could threaten Kandahar, the largest city in the south and the Taliban's informal capital when it ruled Afghanistan. Capt. Shoaib's raid helped break the chain, but both he and the Americans expect he'll have to launch many more to keep the Taliban on their heels. "We will go 10 times," he said. "We will go 20 times — until we make it happen."